While we love to cook bbq competitively, we still remember our roots...tailgating at SMSU Mustang football games. 2017 was our 15th year of supporting Mustang Football and having a great time in doing so! Over the years our core group has kept expanding. This great group is always looking for a reason to cheer on our team. We always make new friends at every game! For 6 Saturday home games each fall you can find us just across from Mattke Field and the Regional Events Center on the campus of Southwest Minnesota State University. The yellow trailer is no more...but still lives with us in spirit! 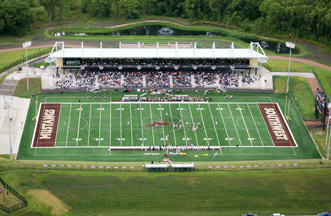 Opened in 2008, the Regional Events Center is the best football venue in all of out-state Minnesota!